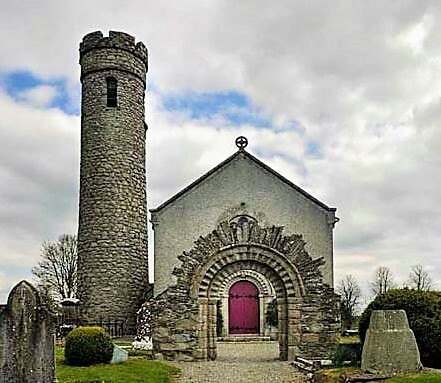 The monastic site of Castledermot was founded by St. Diarmuid in c.812, although there is evidence to suggest that hermitages may have existed here since the 6th century. St. James’ Church of Ireland Church now stands on the site of the original monastery. The construction of a 20m high round tower and the presence of two ornate 10th century high crosses indicate the site’s wealth and importance. A Romanesque stone church also formed part of the monastery. However, today only a well carved doorway survives. The community’s wealth attracted some unwanted attention, and Viking raids are recorded in the Annals for the years c.841 and 867. The hogsback stone burial in the graveyard is another indication of contact with the Vikings. After the Anglo-Norman invasion of 1169, Walter de Riddlesford was granted the barony of Kilkea. Tristledermot, as it was then known, was established as a medieval borough beside the existing monastery. De Riddlesford constructed a castle in the town. This was then rebuilt in 1485 by the Earl of Kildare. It was at this time that the name of the settlement was changed to Castledermot. The castle was destroyed by Cromwellian forces in 1650 and no remains of the building have yet been found. Tristledermot quickly became a place of administrative importance, particularly in the 14th century. From the early days of the Anglo-Norman colony, Great Councils were held where King’s officers met with the chief magnates of the land. These gradually evolved into parliamentary sessions. The first documentary reference to an Irish parliament was a meeting at Tristledermot in 1264. A structure known as the Parliament Building was located on the market square until the 18th century. Although the settlement was on the main route from Dublin to Kilkenny, it was also a frontier town, close to native Irish territories. In 1275, the townspeople were given a royal ‘murage grant.’ This allowed them to collect tolls from people entering Tristledermot and pay for the construction and maintenance of town walls. The wall was completed around 1302 and gave Castledermot its distinctive lozenge shape. Access to the town was via three gates; Dublingate to the north, the Carlowgate to the west and the Tullowgate to the south. Despite the construction of protective walls, the town was sacked in 1316 by Edward the Bruce, in 1405 and 1427 by the McMurroughs, and was eventually taken over for a period by the Kavanaghs. By the late 15th century the town was at least nominally back in the hands of the English crown. In reality though, it was the Earl of Kildare that controlled the town. Castledermot as it was by then known was again sacked in 1530 by crown forces aiming to take it from Silken Thomas (son of the ninth Earl of Kildare). Trade was always an important activity in the town with the first royal grant for a fair given in 1199. In 1393 Tristledermot was even granted permission for a mint to produce its own coins. Archaeological excavations have provided proof that the townspeople were involved in specialised craft activities including butchery, horn-working, blacksmithing and pottery making. There was even a locally made form of medieval pottery known as ‘Castledermot-ware’. There were two religious houses in the town. The Priory and Hospital of St John the Baptist was founded by Walter de Riddlesford and his wife in 1210, just outside Dublingate. All that remains of this is a square tower. At the southern end of the town was the Franciscan Friary, of which the impressive church ruins remain. It was founded in c.1247. Inside is a rare cadaver grave stone dating to about 1520. Both of these houses were dissolved in 1541.